Today we left behind New Orleans. When planning our journey north into Mississippi using my iPhone I thought it was a strange bug in Apple Maps that it had us going directly across Lake Pontchartrain. But then Google Maps had us doing the exact same thing. Wait a minute, is there a bridge all the way across the lake? More than 23 miles long, the Lake Pontchartrain Causeway is amazing to behold. I wonder how hard it was to build? Just before lunch we stopped in the small town of Kentwood, Louisiana and walked up to the Kentwood Historical and Cultural Museum. We rang the bell and waited to be let in. I sure hope this is the right place. "Y'all here to see the whole museum or just Britney?" Oh yes, we're in the right place. An unassuming community museum, proud of the heritage of its local people. Kentwood doesn't have the dairy festival anymore. We didn't dig into the reason why. Kentwood was known for logging, but now it is also known for something else. See it on the left side of the picture? Fay, the woman who runs the museum, is so kind. We interrupted her making a meal for a friend who recently suffered a family loss, she has a big heart. This wasn't one of those museums where you pay your admission and guide yourself. No, Fay walked us through the entire collection, telling us stories about individual items and sharing about her personal history with the pop star. It was fun. Wings used on stage during the Femme Fatale tour. All of these items were gifted to the museum by a fan in England. A Britney fan in Oregon created this miniature stage, complete with flashing lights. 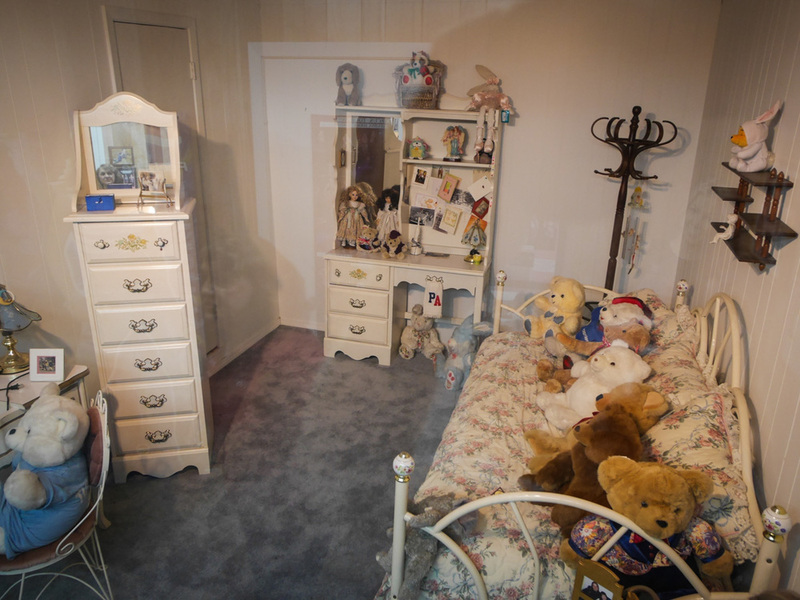 These are the items from Britney's childhood bedroom. When our tour concluded we were given many items from past tours as gifts. The museum is free with donations accepted. However if you want a photo of these wings it will set you back $3. The museum is free with donations accepted. However if you want a photo of the wings it will set you back $3. Worth every penny.